Researchers have discovered a novel mechanism in a combination drug therapy that shows potential as a new approach for treating acute myeloid leukemia (AML) and many other cancers. When combined, these agents cause interactions that significantly disrupt cancer cells' ability to survive DNA damage, according to a preclinical study published today in the journal Cancer Cell. The study looked at a combination of two drugs, both of which significantly reduce some cancer cells' ability to survive and propagate. One was a DNA methyltransferase (DNMT) inhibitor, while the other was a poly-ADP-ribose polymerase (PARP) inhibitor, talazoparib. PARP inhibitors target and block proteins which cancer cells depend on to repair DNA for their survival. 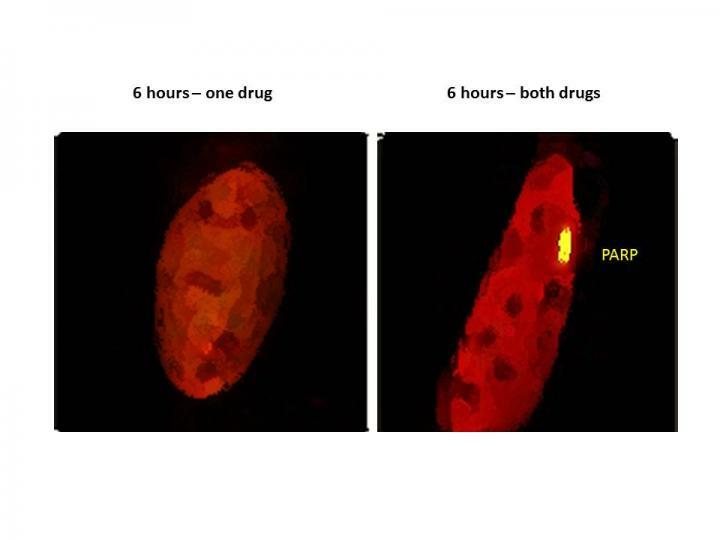 DMNT inhibitors, such as 5-azacytidine and decitabine, boost the interactions of PARP inhibitors to block these proteins even further, causing cancer cell death, the researchers found. "Our preclinical data suggest that combining low doses of these inhibitors will enhance the clinical effects of both drugs as a potential treatment for patients with AML," says the senior author, Feyruz V. Rassool, PhD, associate professor of radiation oncology at the University of Maryland School of Medicine (UM SOM) and a researcher at the University of Maryland Marlene and Stewart Greenebaum Comprehensive Cancer Center (UMGCCC). "Moreover, our initial data suggest that subtypes of AML with a poor prognosis are likely to be sensitive to this new therapeutic approach," she says, adding that less than 10 percent of patients with certain forms of AML achieve long-term survival. A blood cancer characterized by the rapid growth of abnormal white blood cells, AML is typically treated with chemotherapy, in some cases followed by a stem cell transplant. DNMT inhibitors are frequently used to treat patients unlikely to respond to chemotherapy or who have not responded to chemotherapy. Dr. Rassool says that a clinical trial is planned to test whether low doses of a DNMT inhibitor, decitabine, and an investigational PARP inhibitor, talazoparib, can be safely combined and whether this therapy shows efficacy for AML patients, especially those who cannot receive intensive chemotherapy, whose leukemia is resistant to treatment, or who have experienced a relapse after treatment. The trial, which will be led by Maria R. Baer, MD, professor of medicine at UM SOM and director of hematologic malignancies at UMGCCC, will enroll patients at the Greenebaum Comprehensive Cancer Center and several other sites. "This is really a new paradigm mechanism that is being translated into a clinical trial," Dr. Rassool says. "It's not just putting two drugs together. We have shown in the laboratory that the proteins that these inhibitors target actually interact, so the effects of these inhibitors are enhanced through this interaction. Therein lies the novelty of this new approach." The research, conducted in cell lines and mouse models, explored enhancing the cancer-killing effects of PARP inhibitors not only in regard to AML but also triple-negative breast cancer. PARP inhibitors have shown efficacy for a small group of patients with breast cancer with inherited mutations in BRCA genes, but have failed in the more aggressive triple-negative disease. "Our findings suggest that this new drug combination would also help patients with this type of aggressive breast cancer as well as other cancers, such as lung, prostate and ovarian cancers," Dr. Rassool says. Dr. Rassool and colleagues at UMGCCC and UMSOM collaborated with scientists at the Sidney Kimmel Comprehensive Cancer Center at Johns Hopkins and the National Institute on Aging. Stephen B. Baylin, MD, the Virginia and DK Ludwig Professor of Oncology and Medicine and associate director for research programs at the Johns Hopkins Kimmel Cancer Center, is the study's co-senior author. The research, which builds on previous work by Dr. Rassool and Dr. Baylin, was funded by a number of grants, including Stand Up To Cancer's inaugural Laura Ziskin Prize in Translational Research – a $250,000 grant awarded to the two researchers in 2012. Ziskin, a Hollywood film producer who died of metastatic breast cancer, was a co-founder of Stand Up To Cancer, an initiative founded in 2008 by nine women in the entertainment industry to accelerate groundbreaking research and bring new treatments to patients as quickly as possible. PARP inhibitors are used primarily to treat tumors linked to defects in BRCA genes, but may show promise in other cancers when combined with other drugs. Certain kinds of cancer cells depend heavily on PARP to repair DNA damage. If PARP is blocked, these cells die. PARP inhibitors also cause PARP to become trapped in the cancer cells' DNA, a process that is greatly enhanced when a DMNT inhibitor is added, Dr. Rassool says. This leads to massive DNA damage that cannot be repaired, and the cancer cells self-destruct. DNMT inhibitors suppress DNA methylation, resulting in gene expression that significantly interferes with cancer cell growth. They are not usually combined with PARP inhibitors. "Dr. Rassool and her colleagues have identified an exciting new mechanism for attacking cancer that may ultimately provide a new option for treating patients with leukemia and other cancers," says E. Albert Reece, MD, PhD, MBA, vice president for medical affairs at the University of Maryland and the John Z. and Akiko K. Bowers Distinguished Professor and dean of UMSOM. "We are committed to translational research, and this is excellent example of how we are able to move an important scientific discovery in the laboratory into the clinic where it may potentially benefit patients." In addition to the Ziskin Prize, support for the research came from the Van Andel Research Institute-Stand Up To Cancer Epigenetics Dream Team, the Adelson Medical Research Foundation, the Maryland Cigarette Restitution Fund Program, the Leukemia & Lymphoma Society, and the Intramural Research Program of the National Institute on Aging. The University of Maryland Marlene and Stewart Greenebaum Comprehensive Cancer Center is a National Cancer Institute-designated Comprehensive Cancer Center in Baltimore. The center is a joint entity of the University of Maryland Medical Center and University of Maryland School of Medicine. It offers a multidisciplinary approach to treating all types of cancer and has an active cancer research program. It is ranked in the top 25 cancer programs in the nation by U.S. News & World Report. http://www.umgccc.org. The University of Maryland School of Medicine was chartered in 1807 and is the first public medical school in the United States. It continues today as an innovative leader in accelerating innovation and discovery in medicine. The School of Medicine is the founding school of the University of Maryland and is an integral part of the 11-campus University System of Maryland. Located on the University of Maryland's Baltimore campus, the School of Medicine works closely with the University of Maryland Medical Center and Medical System to provide a research-intensive, academic and clinically based education. With 43 academic departments, centers and institutes and a faculty of more than 3,000 physicians and research scientists plus more than $400 million in extramural funding, the School is regarded as one of the leading biomedical research institutions in the U.S. with top-tier faculty and programs in cancer, brain science, surgery and transplantation, trauma and emergency medicine, vaccine development and human genomics, among other centers of excellence. The School is not only concerned with the health of the citizens of Maryland and the nation, but also has a global presence, with research and treatment facilities in more than 35 countries around the world. http://www.medschool.umaryland.edu.